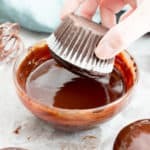 How to Make Homemade Chocolate Frosting Recipe (V, GF): learn how to make easy vegan chocolate frosting that’s smooth, silky and chocolatey. Whipped frosting doesn’t require refrigeration! Vegan, Paleo, Dairy-Free, Gluten Free. Smooth, rich, creamy, sweet… frosting is just the… well, frosting on top of the cake. Amiright?? Er… both literally and figuratively. 🙂 Do you love frosting? What flavor is your favorite? Some of my top favorite frosting flavors are: chocolate, strawberry, peanut butter and classic vanilla. Meanwhile, I’ve been wanting to share a frosting recipe for ages, and now I’m finally ready. (Just don’t ask me about vanilla frosting.) Who’s excited? Frosting is just too important to not take very seriously. Especially on a baking blog. Ya know? But this year, I finally promised myself that it was gonna happen. And it was gonna be GOOD. And right on time for my birthday! Woohoo! So how did it all begin? Well, if you tried my No Bake Chocolate Coconut Bars, you know that I recently cracked my chocolate ganache recipe (which I’m a little too proud of). Since then, I’ve been cooking up all the ways in which I could use that ganache. For example, could I put it on brownies? Yes. Could I put it on cookies? OH YES. Could I put it on top of more ganache? Most definitely. But what else could it turn into? 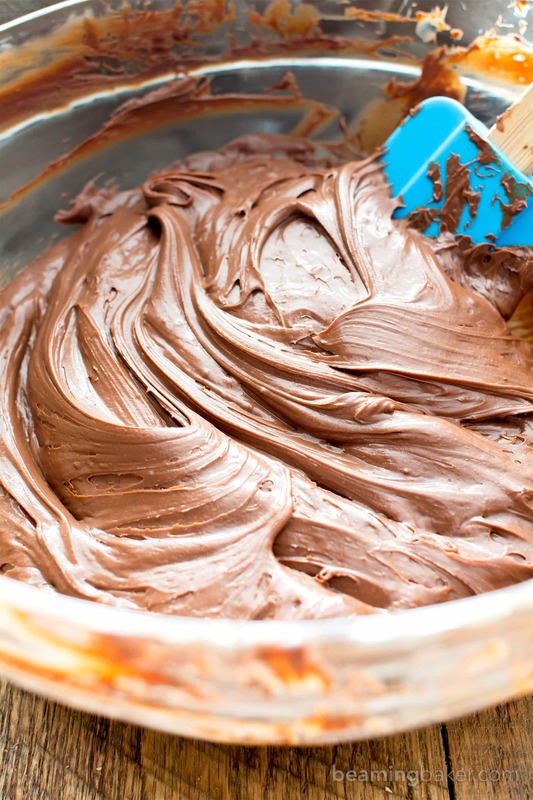 Answer: Whipped Chocolate Ganache Frosting!! 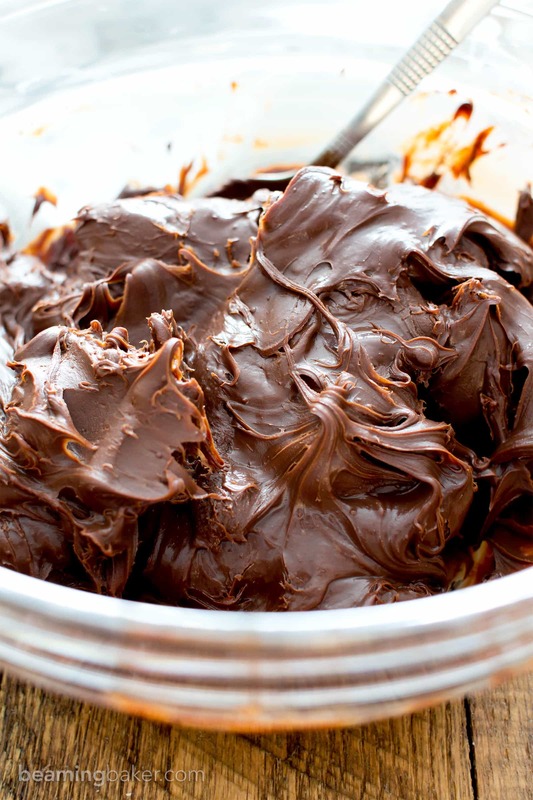 Like, whip up that awesome ganache you just, um, whipped up, and boom! It turns into frosting. Figure A. 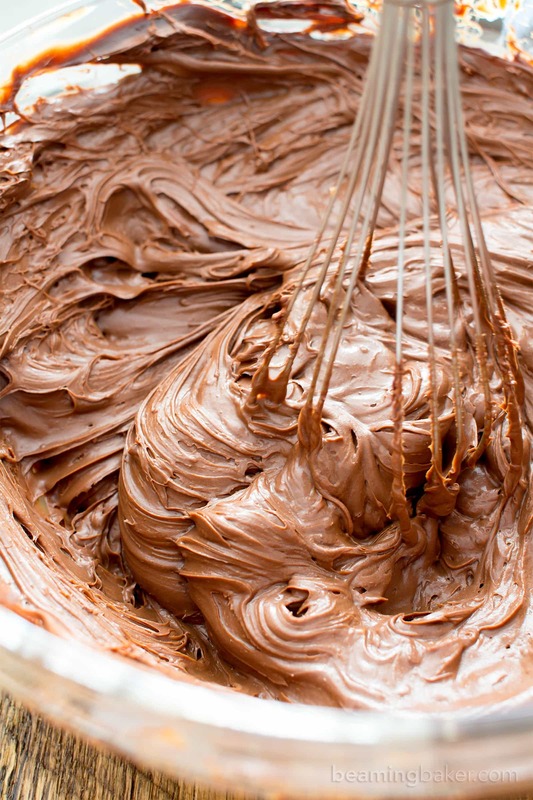 After chilling, the chocolate coconut cream ganache mixture will look like this. As you can see from the finger indentations on the surface… I needed to check for firmness. Lol. I tried whipping up my chocolate ganache recipe as is, but to no avail. The proportions just weren’t right. The ganache frosting became way too thick, or way too watery. Both are obviously a huge no-go for cupcakes. I mean, one (or two, or three trials) practically threatened to bust my piping bags! And if you’ve ever busted a piping bag from all the goshdarn pressure you’ve put onto it, then you know what I mean when I say I’d love to never experience that hot mess again. My other concerns (besides not hand-delivering a hot mess of a recipe to you) were… first: ease. 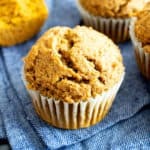 This recipe needs be as easy as possible because who really needs a difficult frosting recipe when they’ve already achieved the awesomeness that is baking homemade cupcakes and waiting for them to cool? Figure B. Be sure to scoop the solid chocolate mixture out of the bowl before beating. The mixture will be solid and look like dark chocolate. Next: Will it be stable at room temperature? 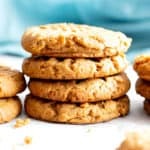 I personally get anxious when I’m told that I have to store baked goods at a certain temperature—especially if said baked goods have my beautifully and carefully piped frosting on top. And said frosting is just waiting to collapse/melt/cause a serious life-crisis on me. Also, can this chocolate frosting taste AS GOOD, if not better than real butter-, powdered sugar-, and all the things we don’t eat ‘round these parts-infused, TASTY chocolate frosting? Like, can we get non-plant-based/allergy-friendly folks to love this more than the good-but-not-so-good-stuff? I’m here to say, YES. Why, yes we can! This frosting is silky, smooth, chocolatey, rich, sweet, but not too sweet, creamy, and just luscious. My friends, I’ve had ALL the frosting in the world. Okay, fine, that’s a slight exaggeration. Heh heh. But I have fancied myself a frosting connoisseur (i.e. dessert hog) for decades. Figure C. Use a whisk attachment for your hand mixer/stand mixer. Once you begin whisking/beating the mixture, it will begin lightening up in color and become fluffier. And this is, by far, my favorite frosting EVER. Oh, and my mom, my sister, her four-year-old kiddo, and Erik think so, too. And it’s not too shabby to make either! And guess what? Precise measurements included. Woohoo!! That’s semi a big deal since loads of frosting recipes used to leave me a tad anxious with the whole, “add as much as needed” instructions. Chalk it up to my Type A personality (is that still a legit thing?? Has it been widely discredited yet? ), but I need precise instructions, ya know? 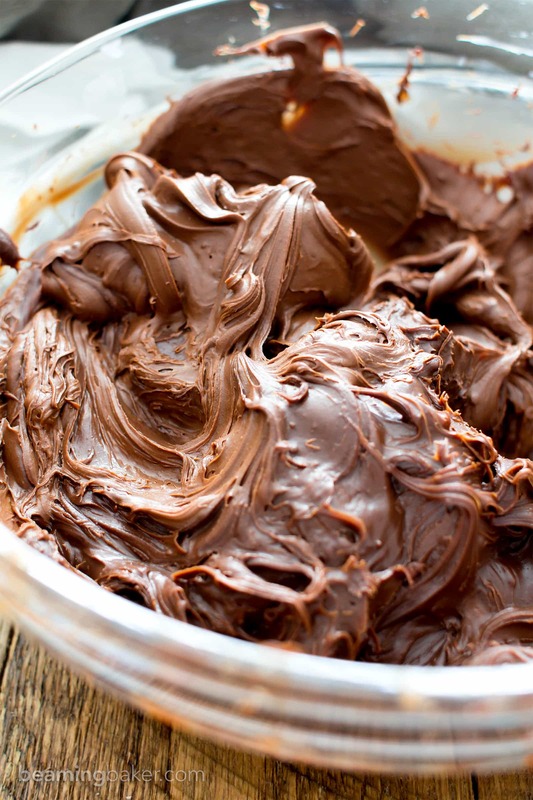 Learn how to make homemade chocolate frosting and be happy. Soooo happy. So happy you might even treat yourself to a brand new, turquoise-beautiful KitchenAid hand mixer (like I did) to feel even more awesome in the ol’ kitchen! With whisk attachment. Because: we are BAKING BOSSES. Drop the mic hand mixer. But don’t ’cause that’ll break it. Figure D. The frosting is done when the entire bowl is lightened up, like the color of hot chocolate. It should be fluffy, and thick enough to stay on the whisk when it’s held upside down, but soft enough to easily pipe. Best of all, you’ll not only learn how to make homemade chocolate frosting, but you’ll also come out with room temperature, shelf stable frosting!!! What what??? And if you were one of the many readers who were impressed/pleased about my latest no refrigeration-required chocolate pecan fudge recipe, then you might just know what all this room temp fuss is all about! 😉 I mean, these frosted cupcakes keep for 3 days at room temperature. Just. WOAH. Silky smooth frosting perfection. Room temperature aka shelf-stable: aw YEAH!! shelf-stable, meaning it keeps at room temperature for 3 days! great on, well… cupcakes! And everything else! What will you be frosting with this recipe? 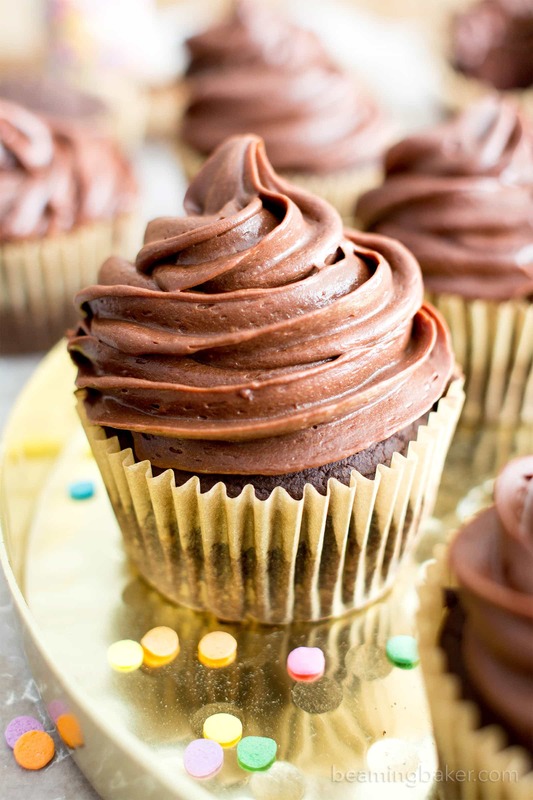 Vegan Gluten Free Chocolate Cupcakes! 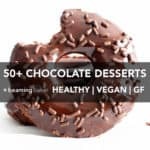 How to Make Homemade Chocolate Frosting Recipe (V, GF): learn how to make easy vegan chocolate frosting that’s smooth, silky and chocolatey. Whipped frosting doesn't require refrigeration! Vegan, Paleo, Gluten-Free, Dairy-Free. 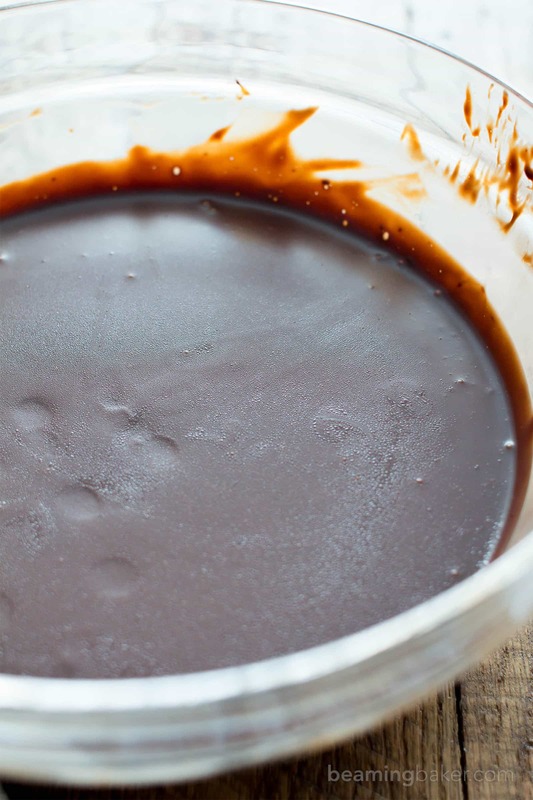 Use the double boiler method to melt the chocolate and coconut cream, or do the following: add coconut cream and chocolate chips to a large microwave-safe bowl. Heat in 30-second increments until melted and smooth. Stir between heating increments, until chocolate is melted. Once completely melted, whisk thoroughly until smooth. Transfer to refrigerator to chill for 2-5 hours. It’s done when the mixture is medium firm, similar to a very firm gel. It will be stiff enough to be solid, but lightly depresses when pressing a finger into it. See Figure A. Using a spoon, scoop this mixture into a large, deep mixing bowl for whipping (or use the same bowl). You may also transfer to the mixing bowl of a stand mixer. If the texture is right, it won’t be too hard to spoon. See Figure B. Allow to soften and warm up a bit at room temperature, for about 10-15 minutes. It should be soft enough to whip, but firm enough to not become liquidy when whipping. See Figure C.
Using a hand mixer, or a stand mixer, fitted with a whisk attachment, beat the frosting mixture until fluffy. The color of the mixture will lighten to that of milk chocolate. See Figure D.
Frost completely cooled cake or cupcakes! Enjoy. Try this moist & delicious Vegan Gluten Free Chocolate Cupcake recipe and this amazing Vegan Chocolate Cake. - *To use canned full fat (not light) coconut milk, do the following: The night before, chill 2 cans of full fat coconut milk, being careful not to shake the contents. Open the can (or cans, if needed) and scoop the firm, white solid part off the top—this is the coconut cream. Measure out what’s needed. - This frosting recipe makes enough frosting for 12 cupcakes with medium high frosted tops. 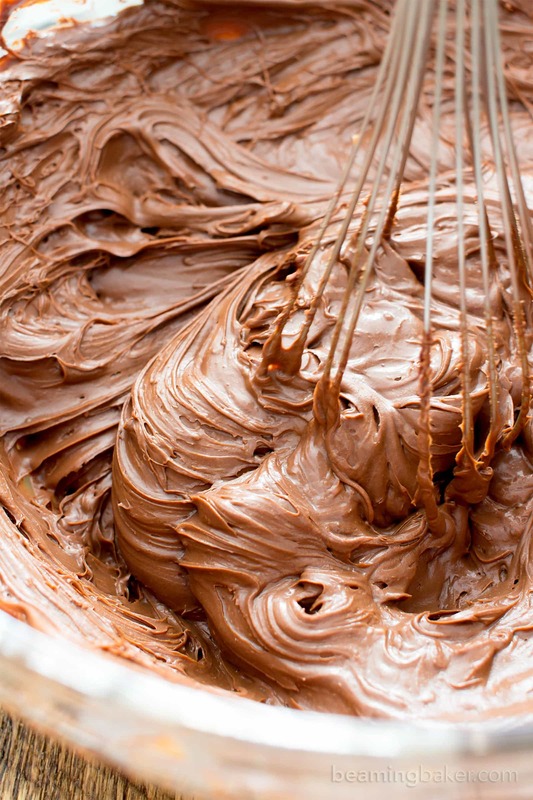 - Use frosting immediately after whipping. Frosted cupcakes will keep for 3 days at room temperature. Store frosted cupcakes in an airtight container, in a cool, dark environment for up to 3 days. Can you please tell me what weight the chips would be? 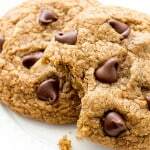 How much chocolate should I use in grams or ounces? I can’t get the chips but had to buy bars of chocolate so not sure how much to use!!! THANK YOU!!!! Thanks for this amazing recipe!! I used it to frost a chocolate cake but had to heat up the frosting to soften it to spread. Any suggestions on making it creamier? Hi! I read your post and you mentioned having a recipe for vanilla and strawberry (Vegan, Paleo, Gluten Free, Dairy-Free, Refined Sugar-Free) frosting too, so you have it? We love frosting, but don’t like chocolate ???? Hi Mercedes! I’m actually still working on the vanilla and strawberry frosting. I want to make sure I get it just right. Thanks for your patience! I would love to try this but not in chocolate flavor. 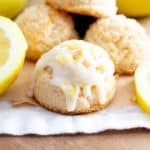 What will be a substitute for choco chips if I wanted to make a lemon coconut frosting that can stand room temp? Hi, Demeter. I am six months in the new life of no milk/dairy, chicken eggs, wheat, gluten and a number of other foods that seem to be in everything! I am sorely missing chocolate and was encouraged to see your yummy looking icing recipe! Bummer though that cane sugar is also on my list of no-can-do ingredients and it is in the chips you recommend. 🙁 If it were just a lifestyle choice, I might just decide to indulge once in a great while, but I was very very I’ll for over a year and I don’t want to go back…but I NEED CHOCOLATE!! 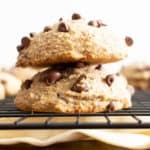 LOL Is there a cane-sugar free choc chip you think would be a good tasting alternative? This recipe looks absolutely INCREDIBLE. 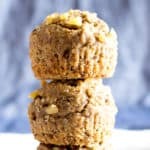 I’m vegan myself, my mom is gluten-free, and my family usually doesn’t eat sugar, so this recipe is soo perfect. I’ll be making it for my dad’s birthday this Friday! I wanted to make it into a chocolate coffee cake, since my dad loves coffee. Do you think it would turn out well if I add coffee to the chocolate frosting? If so how much do you think would be good? Thank you! Looks amazing! Can it be frozen? Thanks Danielle! Hm, I haven’t tried it, but as long as you let it thaw at room temp for a bit and whip it up again, it might work. Let me know how it turns out! I was in need of a dairy free frosting and had already tried a buttercream one that was horrible. This was an absolute lifesaver, super simple, smooth and delicious. It was also the easiest batch of frosting I’ve made in my life! I used a broken up bar of chocolate instead of chips (no dairy free ones available) and it worked beautifully. Before whipping, I tried dipping some of my cupcakes into the ganache and this also made gorgeous cupcakes. 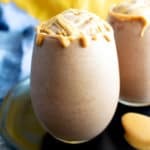 Thank you so much for posting this recipe, it’s pure genius! Hi Julie! It made me so happy to read your comment. 🙂 I’m delighted (yep, delighted!!) that you enjoyed it so much. Dipping it in ganache beforehand is EXACTLY what I did in another recipe hehe—great minds right? 😉 Thanks for taking the time to leave feedback & so much love for the recipe. Happy baking! ???? Is it okay to chill the frosting for longer than 5 hours? It should be okay. 😉 Keep in mind, the longer you leave it, the drier it’ll get in the fridge. So maybe keep it under a day? Enjoy! Hi. I was wondering how this became to look like a chocolate Italian or Swiss (both w/ eggs & dairy) buttercream frosting (It’s actually a compliment ;D )? How did you thought about this? Thank you soo much for sharing the recipe with us. It is unbelievable how smooth the frosting becomes. 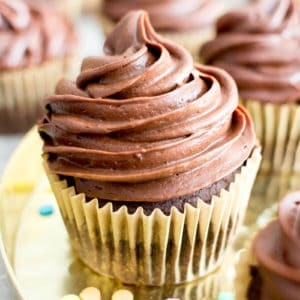 Could I perhaps make the frosting day before and leave on bench and next day ice cup cakes?